Mining Cultural Landscape Erzgebirge/Krušnohoří is part of the Tentative list of Germany in order to qualify for inclusion in the World Heritage List. 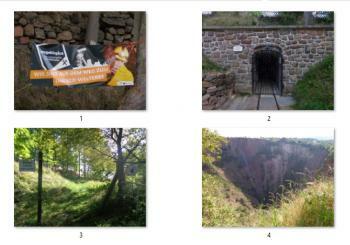 Erzgebirge / Krušnohoří Mining Cultural Landscape was originally planned for nomination in 2016. I decided to visit this TL site ahead of its official inscription, in april 2016. This nomination was withdrawn a few weeks later, due to the ICOMOS evaluation, pointing, as I understood, a lack of coherence between the individual components. It is true that this project is difficult to apprehend. On the German side, there is 8 areas, with 39 elements and more than 110 sites (some sites including up to 11 significant objects). The Czech side consists of 4 cultural lanscapes, one lime work and the Red Tower of Death. The nomination dossier avaiblable on the WHC site does not show clear maps of the different elements, sites or significant objects, and I spent considerable amount of time researching the internet to correctly locate all objects. I found this site in German (http://www.jenskuglerverlag.de/studien-dokumentationen) which lists some studies with maps of some of the elements. - head office of companies working in mining (or in watch making, or cutlery and tableware). - administrative building of mining companies, far away from the mines. - professional schools, I imagine in which engineers were trained for mining. - churches and cathedral where miners could attend service. - castle or historic centers of towns with mining history. - a hospital for workers. - a monastery with no evident link to mining industry. The Czech part is more coherent, with 6 elements centered around villages built for mining and their immediate environment. Anyway, apart from those consideration, visiting the area is fun. You need a car to go around all the elements, because they are scattered around a quite large area. Going by public transport would be time consuming, and not always rewarding. It is impossible to know beforehand what to expect, never sure to even locate some sites (even with good maps), or being able to visit (at one location, I was rudely yield at by a woman arguing it was a private propriety, as I was only taking a picture from the public road). Some sites are anti-climaxic, with a very small elements (like the mouth of an adit or a ditch). Town centers are easier to visit (Marienberg, Annaberg, Schnneberg), but are not the nicest town centers in Germany. Altogether, I would recommend seing a few part in the German part (to be able to tick the sites) and concentrate on the Czech component. Besides, five of the six Czech elements are within a 30 minutes drive from Karlovy Kary, another TL element with good hotels infrastructure. The 4 czech cultural landscape componants are centered around villages, with mining elements and landscape shaped by mining industry. There are all situated in the hills, and there is very nice view on the valleys below. The Lime Works in Hàj, near Loucna poc Klnovcem is difficult to find. Check Google map beforehand. No signpost whatsoever. This difficulty makes visiint the site even more enjoyable. 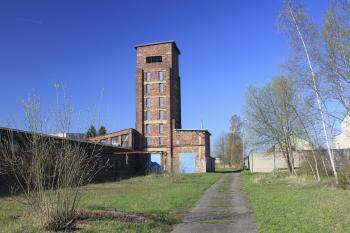 It is an abandonned lime works, quite well preseved in the middle of a forest. The Red Tower of Death is a simple brick tower, in the middle of an industrial park near Jachimov. It is an important national cultural momument in the Czech Republic, because it is linked to uranium extraction after WWII, and it symbolises suffering from political prisoners in forced-labour camps of that period. It can be seen from the road. There is no signs or indication. The industrial park is not open to public. I went to its reception, and the security guards nicely allowed me to sign in, enter and check out the tower from close. The guard only spoke a few words of english, so it was a bit difficult to understand, but he was very nice, explaining to be careful about trucks. The enclosed picture hows the Red Tower. I visited several towns around Dresden recently, and Altenberg was one of them. It is in a mountainous area close to the border with Czechia and is known for cross country skiing among Germans. Altenberg is also one of the mining towns collectively nominated by Germany for a WHS. It sounds like it is for sure to become a WHS within a few years. I visited on a morning trip on a Sunday by train from Dresden. Both the tourist office and the mining museum were open on the Sunday morning. So I visited the museum by one of the entrances to the tin mine and then went to see what they call "Pinge," a huge hole that was created when the mine collapsed in 1620. The diameter today is about 400 meters, and the depth is about 150 meters. PHOTO 1: The banner reads, "Wir sind auf dem Weg zum Unesco-Welterbe," which means, "We are on the way to Unesco World Heritage." PHOTO 2: One of the entrances to the mine. PHOTO 3: There is a 1200 meter-long fence surrounding "Pinge." The sign reads, "Bereten verboten: Lebensgefahr!" I later found out that it meant, "Entrance forbidden: Fatal!" As you can see, my German is not very good. "At the request of both States Parties, the examination of this nomination is postponed to the following cycle of evaluation"